Every June, almost without fail, a winter low pressure weather system forms off the coast from us and produces a lot of rain and wind. 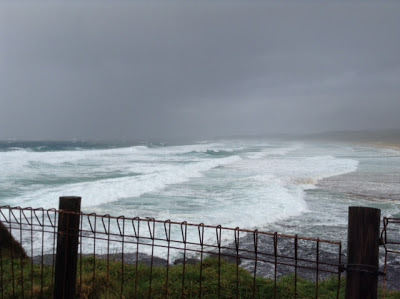 It’s a kind of winter cyclone (hurricane) that lasts for a few days and usually causes some flooding, minor building damage and electricity outages. I first experienced this the weekend I moved into the house a few decades ago. That time we had 500mm (20 inches) of rain in the three days which produced a 50 year flood. At the time I wondered if I had bought a ‘lemon’. But the house will always be safe on the hill and while our creek, breaking its banks, floods the lower paddocks, it soon drains away. This happens even quicker when the coastal lake our creek runs into is opened to the ocean by the raging surf that always accompanies these storms. This time we had lots of rain, some wild thunderstorms and plenty of wind. We woke to the inevitable power outage, which the power company said would be fixed in a few hours. As time went on we realised we had a continuing ‘brown out’ despite the power being back on. Some of our valley residents were experiencing the same problem. Neighbour Bob and I walked the power line that runs through our property from the main one on the highway to us and our neighbours. We found that it had become tangled in trees. The power company was advised, came quickly and made repairs. On a sad note, the thunderstorms caused one of Bob’s horses to panic and get caught in a fence. It was so badly injured he had to put her down. For a man who loves his horses this was very distressing. We all felt for him. The downside, for us, out of all this? Our house water pump did not like running on reduced power and threw in the towel after 25+ years of life. Neighbour Steph is a plumber and will have a new one installed in the morning.